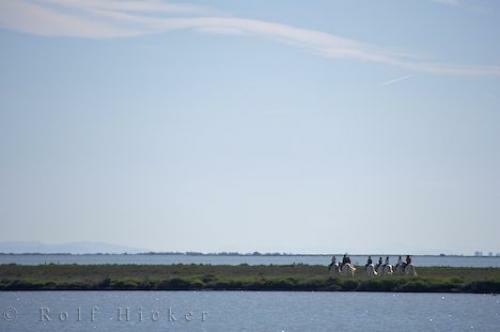 A great way to travel to remote spots in the Camargue is on horse back with a guide. Explore the marshes, wildlife, and scenery of the Camarge in Provence, France. Horse riding, Promenade a Cheval, in the Parc Naturel Regional de Camargue, Plaine de la Camargue, Camargue, Les Bouches du Rhone, Provence, France, Europe. Provence, France as they travel by horseback.